Australian Border Force (ABF) and Commonwealth prosecutors have been relying on evidence provided by Australia’s biggest tobacco company to charge black market traders. ABF has handed seized tobacco to British American Tobacco (BAT) to be tested in its laboratory, an ABC investigation has revealed. BAT has analysed the product and then provided documentary or expert evidence which has then been produced in court. It raises questions about independence and integrity and potentially breaches a major global agreement. The World Health Organisation treaty limits tobacco companies’ involvement with law enforcement to only what is strictly necessary. Tobacco companies argue they are being good corporate citizens by helping in the fight against the black market trade, but anti-smoking advocates say they are just protecting their bottom line. Earlier this week, the ABC revealed big tobacco companies were propping up law enforcement by providing high-level intelligence and paying for surveillance technology. There is a government agency called the National Measurement Institute that provides analysis for law enforcement. A spokesperson for ABF said it used the agency “where possible”, but conceded there were times it had relied on the tobacco companies. “There are instances in which tobacco companies have provided assistance in identifying counterfeit or illicit tobacco and have supplied statements for court proceedings,” the spokesperson said. The Commonwealth Director of Public Prosecutions represents the agency in most court matters and, in a statement, said it “relies on evidence obtained from investigative agencies”. When contacted by the ABC, BAT confirmed it had loaned its facilities to more than one law enforcement agency. “That was about establishing whether the products were tobacco products, which is important to know before they can proceed with prosecution,” BAT spokesman Josh Fett said. He said BAT approached law enforcement with the offer, and did not charge them for the service. “I certainly don’t think there’s any conflict … it’s up to law enforcement agencies whose service they use and in these cases it was us,” he said. The ABC has obtained more documents showing the level of the tobacco giants’ involvement in police operations. 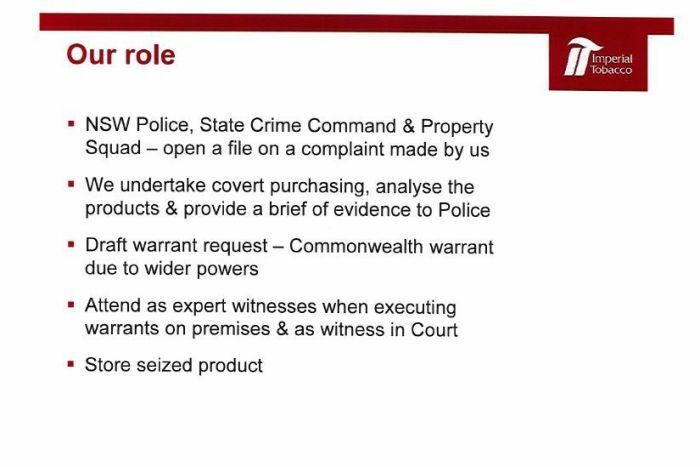 An Imperial Tobacco PowerPoint presentation boasted its company and Philip Morris “assisted NSW Police to conduct raids” at six locations in Sydney in 2015. “Our role … provide a brief of evidence to police,” it read. Imperial Tobacco emailed the presentation to New South Wales Labor MP Paul Lynch in October 2015. “I was astonished I must say, I had no idea that the cooperation between a large tobacco company and the police was as intense as it is,” he said. He said NSW police needed to own up about the level of cooperation they had with the tobacco companies. “The police have to be entirely transparent about what exactly they’re doing and upfront about the reality that tobacco companies are making profit out of their activities,” he said. “Police need to behave as the police and conduct their own investigations, prepare their own briefs and execute their own warrants. New South Wales police declined to answer the ABC’s questions about the cooperation and declined to specifically comment on the tobacco industry. They sent a statement saying they regularly worked with many industries. “Their involvement is non-operational,” the said. Imperial Tobacco Australia also declined to answer the ABC’s specific questions. It also sent a statement, in which it says [the industry] will continue to provide intelligence on the black market. “Imperial Tobacco Australia makes available to relevant enforcement and prosecuting authorities our personnel who hold expert knowledge in respect of tobacco products. “It is our view that the cooperation of our industry with enforcement and prosecuting personnel is vital to combatting serious and organised crime that is responsible for much of the trade in illicit tobacco. SOUTH SUMATRA, Indonesia — Surrounded by farmland and plantations in the small village of Teluk Kemang Sungai Lilin in South Sumatra, a boy, just 8 years old, sits smiling with his mother. But this boy has a tumultuous past and a reputation that precedes him, having undergone a recovery most children will never face. Six years ago, Aldi Suganda, also known as Aldi Rizal, was a 2-year-old chain smoker addicted to cigarettes, smoking packs each day. “It was hard for me to stop,” he said. “If I am not smoking, my mouth taste is sour and my head feel dizzy. “I am happy now. I feel more enthusiastic, and my body is feeling fresh,” he said. He became a global sensation as the “chain-smoking toddler,” with video clips of him puffing excessively on an endless cigarette supply watched by millions around the world. His mother, Diana, thinks back to that period and recoils at the memory. Her son would get angry, she remembers, and throw tantrums if she withheld cigarettes from him or failed to give him money to obtain them. “He (would) start to smash his head to the wall. He was crazy, hurting himself if he didn’t get a cigarette,” she said. Aldi is the youngest of three boys born to Diana and her husband, who requested not to be named. But he is far from the only child who picked up the habit across the islands of Indonesia: More than 267,000 children there are estimated to use tobacco products every day. Diana believes Aldi’s addiction began with peer pressure and exposure to smokers. He accompanied her each morning to the market where she sells vegetables grown on their land. People there could have taught him to smoke, and he could easily get cigarettes by asking at the market, she said. In many regions of the world, this might seem unrealistic and like an excuse, but in Indonesia, it’s highly likely. The country has the highest percentage of male smokers globally and among the highest rate of adolescent and child smokers in the world — fueled by lack of control over advertising, relaxed sales and low prices. Today, Aldi is a healthy young boy who attends school and gets good grades, but to get here, it took years of rehabilitation with the country’s leading child psychologist, Dr. Seto Mulyadi, chairman of the nation’s National Commission for Child Protection. His road also didn’t end with his tobacco cravings. Soon after his recovery, he replaced tobacco with food and began to overeat as a means of compensation, eventually becoming obese. But a second bout of rehabilitation to tackle this overeating created the healthy, stable young boy sitting beside his mother today. Mulyadi believes the one benefit of working with children who have an addiction is their mental agility. In Aldi’s case, his age and intelligence meant he responded quickly to his treatment, in which Mulyadi distracted the 8-year-old with running, climbing and playing while slowly reducing the number of cigarettes he smoked each day. But treatment was intense and required Aldi to go to Jakarta for a few months to be with Mulyadi every day. And cured he is — at least for now. In 2013, more than 57% of men were reported to be smokers in Indonesia and more than 42% of teens ages 13 to 15, according to the Tobacco Atlas, compared with 17% and 8.2%, respectively, in the United States. It’s estimated that more than 217,000 people die from diseases linked to tobacco use each year in Indonesia, including heart disease and respiratory conditions such as emphysema and lung cancer. With smoking so commonplace and numbers remaining steady or even rising among some groups in recent years, Aldi’s message could go unheard, believes Dr. Lily Sulistyowati, director of prevention and control of noncommunicable diseases at Indonesia’s Ministry of Health. “I’m very worried about smoking in Indonesia,” she said, especially among teens ages 15 to 19. While rates in most countries fell between 2013 and 2016, the rate of smokers under 18 in Indonesia rose from 7.2% to 8.8%. But more worryingly, among 10- to 14-year-olds, more than 3% were smokers in both 2013 and 2016 — the majority of them boys — and more than 18% of boys and more than 9% of girls 10 to 14 had tried a cigarette, according to Indonesia Basic Health Research data reported in 2013. The research also found that 1.5% of boys and 1.4% of girls 5 to 9 years old had tried a cigarette. Sulistyowati believes the problem is worse in rural areas and among poorer populations. “Poor people are spending their money on cigarettes,” she said. In 2013, the richest fifth of the population used 7.1% of their monthly expenditures on tobacco and betel leaf to wrap tobacco, while the poorest fifth spent 12.5%, according to Indonesia’s Central Bureau of Statistics. The poorest fifth spent similar proportions of their wages on grains and tobacco — 15.5% and 12.5%, respectively — and spent six times more on tobacco than on dairy and egg products. Rural regions also tend to be populated with people with lower incomes. There, parents’ priorities are working and earning money for their families, which can leave children vulnerable to influences such as smoking while parents are distracted. “(These areas) are a different situation. Parents focus on how to work and get money, not on the health of their children,” Sulistyowati said. In addition, children begin working young to earn money that they can then spend on cigarettes, said Dr. Aman Pulungan, president of the Indonesian Pediatric Society, who has been monitoring and working on the issue of childhood smoking for decades. “It’s country life,” he said. Smoking among children and teens is still a problem in the cities, highlights Silistyowati, but there, people know that the habit is bad for their health and children instead hide their addiction from their parents, she said. “They try it with friends,” she said. Icha now smokes at least one pack of 12 cigarettes each day and says half of her classmates also smoke, some in front of their parents. Her own parents tried to ban her from smoking but after little success now just ask that she try to reduce her habit. Pulungan added that many parents don’t fully understand the risks associated with smoking and that its prevalence among adults helps that ignorance persist, particularly in rural areas. Part of the problem, Sulistyowati and other experts say, is the ease of access and pervasiveness of smoking in Indonesian culture. He believes that in addition to peer influence, the root causes of the epidemic include advertising, lack of laws — or enforcement — in public spaces, sponsorship of venues by big tobacco companies and the way cigarettes are sold. Nonsmoking sections in restaurants are very small, he said. In addition, tobacco companies are still sponsoring sporting and musical events as well as public buildings or clubs. This sponsorship has come down in recent years, he said, but he now believes that hidden advertising is growing — through TV and culture. “(Kids) think if you want to become a man, you have to smoke,” he said. 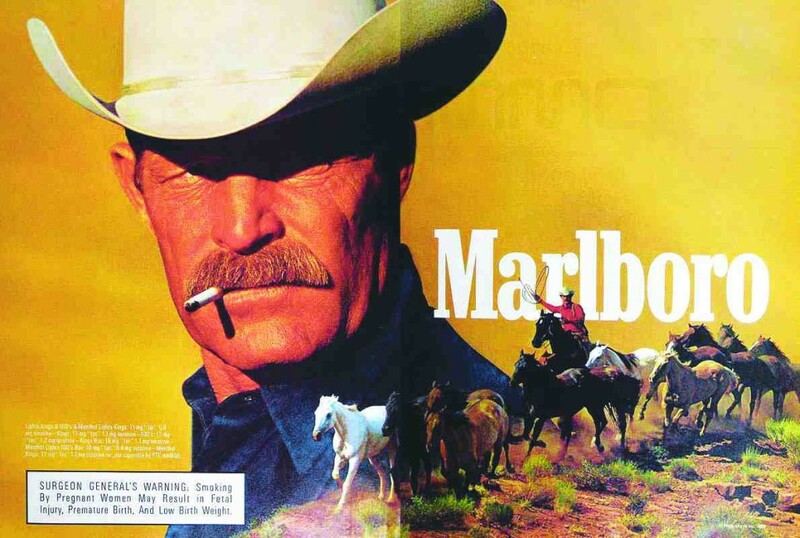 The issues of advertising and masculinity linked to smoking faced many other countries just a decade or two ago, but while rates across the West declined, companies and efforts to boost tobacco interest transferred to countries where bans and laws did not prohibit their existence, such as Indonesia, Pulungan believes. In rural areas, “the small shops, grocery shops, are sponsored by cigarette companies, and they can put adverts anywhere,” he said. “No one controls this.” He also mentions sports clubs that have tobacco companies as part of their names. “Advertising is of more interest to the youth,” Sulistyowati said, adding that companies entice adolescents by associating cigarettes with success and fame. “Schools can get sponsorship” from big companies, she said. Again, while many countries have had bans against this for some time, Indonesia has no national laws in place — though some municipalities have introduced them, she said, including Western Sumatra. Of the big six global tobacco companies, Phillip Morris International dominates the market in Indonesia, according to 2013 data from the Tobacco Atlas. The company did not respond to a request for comment. The Ministry of Health is now working with the Ministries of Education and Communication to help prohibit sponsorship and advertising, as well as the Ministry of Transport to implement and enforce existing smoking bans on public transport. Almost half of the country’s municipalities have regulations in place for smoke-free areas, said Sulistyowati, and universities have committed to having smoke-free campuses through the Ministry of Education. Graphic health warnings were also introduced on cigarette packets in 2014 to put people off the habit. But “it all depends on the commitment of the local head, or mayor, of a district,” Sulistyowati said. “Indonesia is a big country,” at more than 1.9 million square kilometers (more than 740,000 square miles). The final hurdle is the cost and ease with which people can buy cigarettes: They can be bought individually — which makes them more affordable to people with lower incomes — and a pack of 12 can cost as little as $1 at most vendors and kiosks, said Sulitsyowati. All 34 provinces have had regulations in place since 2012 to prohibit the sale of individual cigarettes, but enforcement has not been that effective. One kiosk vendor in Jakarta, who did not provide his name, said most children buy individual cigarettes from him even though selling them in this form is breaking the law. “Everyone sells cigarettes to them,” he said. Globally, experts agree that one of the strongest tobacco-control policies has been taxation. The rising cost of the habit, linked to higher taxes, has meant that many can no longer afford to smoke, and those who can smoke provide revenue for anti-smoking campaigns and quitting support services, to name a few options. “The evidence suggests increasing pricing is the single most effective way to reduce demand,” said Vaughan Rees, director of the Center for Global Tobacco Control at the Harvard T.H. Chan School of Public Health, in a previous report by CNN. “In states where we see the highest tax rates, we see the lowest prevalence,” he said, highlighting New York City, where former Mayor Michael Bloomberg introduced city taxes on top of state taxes in 2010. Now, the Ministry of Health is working to align with other ministries as well as international organizations, such as the World Health Organization, to tackle the appeal of cigarettes once and for all. This includes aligning with the WHO’s Tobacco Free Initiative and its strategy to reverse the global tobacco epidemic, known as MPOWER, which features six policies that have been proved to make an impact, such as protecting people from smoke, enforcing bans on advertising, and raising taxes. The ministry also hopes to provide greater support for people trying to quit smoking and to increase public awareness about tobacco’s harms — as well as push harder for the country to join the Framework Convention on Tobacco Control, a global public health treaty formed in 2005 to tackle the global tobacco epidemic. Today, 181 states have signed the convention. Indonesia is not one of them. With all this eventually in place, Aldi’s message may finally reach those who need to hear it: young children facing the allure of smoking tobacco. Though cases like Aldi’s seem very rare on the surface, there are similar ones in Indonesia that don’t get serious attention, said Mulyadi, who treated Aldi. 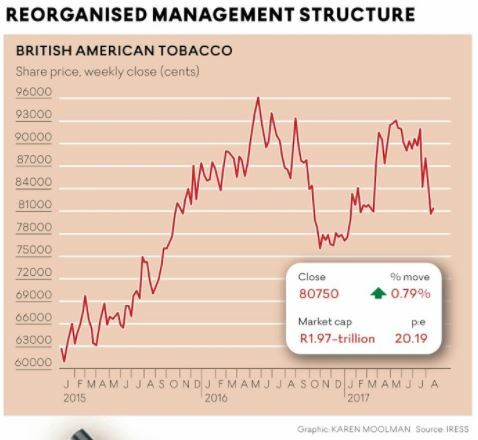 Tobacco firm British American Tobacco (BAT) said on Thursday it had overhauled its organisational and management structures following the successful acquisition of Reynolds America. The company has now created three regions to encompass activities, with sub-Saharan Africa now paired with the Americas. The new structure would enable better, more integrated resource allocation and decision making across geographies and categories, BAT said. Jack Bowles, regional director, Asia-Pacific, would be appointed to the newly created role of chief operating officer for the international business, excluding US, BAT said in a statement. This would take effect on October 1. Ricardo Oberlander, regional director for the Americas, would lead the Americas and sub-Saharan Africa region. Tadeu Marroco, regional director, Western Europe, would be appointed director for Europe and North Africa. Johan Vandermeulen, regional director for Eastern Europe, Middle East and Africa, would be appointed director for Asia-Pacific and the Middle East. The tobacco firm has come under pressure recently, after news in August that UK authorities would investigate allegations of misconduct made against BAT over its African activities. That news came after the US Food and Drug Administration said it was considering regulating the level of nicotine in cigarettes to nonaddictive levels. In mid-morning trade the company’s share price was down 0.11% to R800.33. The company has lost 16.03% in the past three months, but remains up 2.91% so far this year. Bosnian tobacco company Fabrika Duhana Sarajevo [SAJ:FDSSR] said on Thursday it turned to a net loss of 620,700 marka ($376,300/317,400 euro) in the first half of 2017, from a profit of 675,500 marka in the like period of last year. Operating income fell 27.8% year-on-year to 11.7 million marka in January-June, while operating costs decreased 17.8% to 13.8 million marka, Fabrika Duhana Sarajevo said in a statement. The company operates in Bosnia’s Federation, one of the two autonomous entities forming Bosnia and Herzegovina. Bosnia has one more tobacco factory, Fabrika Duvana Banja Luka, which operates in the other entity, the Serb Republic. Ahead of the frenetic festival and wedding season, florists in the city have decided to make their shops tobacco smoke-free. The decision, taken by the Trivandrum Florists Association, seeks to protect the environs of its 600 member families and the health and well-being of thousands of customers. Passing the resolution – in line with the Indian tobacco control law COTPA’s prohibition of smoking in public places – at its annual Onam gathering on Wednesday, the association also decided to set up statutory warning boards in member shops. Association President M Vairavan Pillai presided over the function. General Secretary C Sasidharan Nair, Treasurer Haridas, Vice Presidents C Sukumaran Nair, K Radhakrishnan and S Ambika and Joint Secretaries S Sreekumaran Nair, T Suresh Kumar, T Manikantan and J Reena were also present. We all know how tobacco companies sneak in surrogate advertising as they are not allowed to advertise their products. But Philip Morris International (PMI) Inc., the 160-year-old tobacco giant, pushed its top cigarette brands like Marlboro blatantly. It approached small shops and kiosks selling cigarettes and gave them free attractive boards with its advertisement to adorn the front of their shops and paid shopkeepers around Rs 500 as an incentive to break the law. The tobacco major roped in smart, young executives, mainly girls, to gift cigarette packs to youngsters in bars, discos and at parties. However, after the Cigarettes and other Tobacco Products Act of 2003, which allowed tobacco companies to advertise in shops, was amended, these ads were prohibited. And in mid-August, the Delhi government’s Directorate General of Health Services shot off a stern warning to Philips Morris threatening legal action if it did not remove advertisements from kiosks and other point of sale outlets. The letter asked the company why appropriate punitive action could not be initiated against it and its directors. The letter was sent when the health ministry realised that the tobacco company was violating India’s tobacco control law by advertising at outlets where it was selling its products. It also sent these notices to two other tobacco companies, Indian Tobacco Company Ltd., and Godfrey Philips. But this was after a series of earlier warnings which were ignored by these tobacco companies. On March 24 this year, the government had told them to get the ads removed. This was largely ignored. Their stand was that the law only stipulated that the ads should not be outside the outlets and did not mention that these could not be carried within the establishments or shops. Last month, the government shot of another letter reiterating the same, but this too was ignored. An internal document of Philip Morris said that the India market had high potential. Though the government told the companies that they would be held responsible and legal action could be initiated against them, it made no difference as they said it was not being done by them, but by distributors and vendors. When the Act was amended in 2005, it clearly said that there would be no such ads outside shops. A source from the health ministry said that as far as Delhi was concerned, most of the ads had now been taken off and if they spotted any new ones, legal action would be initiated. Till the Delhi government carries out its threat of cracking down on violators, it is unlikely they will ever comply with the rules. This is not the first controversy that PMI has faced. In 2010, the tobacco giant admitted to using child labour at its production facility in Kazakhstan. Human Rights Watch documented 72 cases of children used as forced labour. The reach and marketing power of tobacco companies is huge. According to a 2002 study in the American Journal of Public Health, the tobacco industry in the 1990s increasingly sponsored entertainment events in bars and nightclubs where it displayed cigarette brand paraphernalia and advertisements. Globally, anti-tobacco campaigners have accused PMI of breaking an ethical code when it deliberately targeted new young smokers. Often, cigarettes were given free to those who had just entered the legal age to smoke. The company had earlier aggressively run an advertising campaign in about 50 countries, cleverly targeting the young. Internal documents of the company indicated that those between 18 and 24 years had to be zeroed in. Company executives were specifically told that they must never use the word “promotion or advertising” when they were interacting with sellers or potential users. In 2013, Germany banned promotional images of Marlboro, saying it encouraged children as young as 14 to start smoking. But other countries did not do so despite the fact that seven anti-tobacco organisations in a report charged that Philip Morris was trying to get a new generation hooked to tobacco. The ads of PMI appealed to teenagers as they used attractive models partying, falling in love, travelling, exploring, being cool and even confused. PMI violated its own ethical code which stated that it would not use images and content that would appeal to minors. India enacted the national tobacco control law in 2004 before being one of the first countries to ratify WHO’s Framework Convention on Tobacco Control treaty. It contains a raft of anti-smoking provisions, including tobacco taxes, warning labels on cigarette packs and advertising bans. India, thereafter, strengthened the law in line with the provisions of the treaty. It was ultimately signed by 181 countries. A group of cigarette distributors challenged the law. But in 2013, the Supreme Court ordered that the law be implemented. It said advertisement of tobacco products would attract the younger generation and innocent minds who were not aware of the grave and adverse consequences of consuming it. Delhi has acted strongly, but what about other states? The central government is supposed to monitor and supervise implementation of the Act all over India. Had it done that, all states would have cracked down on tobacco companies the way Delhi has done. The Tobacco Control Programme has the infrastructure and manpower, but lacks commitment to crack down on the tobacco lobby. An anti-tobacco activist said these companies used to set aside a budget to ensure that monitoring officials were well-inclined towards them. It is time to act before matters go up in smoke. The Scottish Government published its national tobacco strategy in 2013. The proportion of children exposed to second-hand smoke at home has almost halved in the last five years. An NHS Scotland and Edinburgh University review of the Scottish Government’s tobacco control strategy also found a “downward trend in smoking prevalence”. It also warned smoking continues to be a bigger problem in more deprived areas. The Scottish Government’s national tobacco strategy, Creating a Tobacco Free Generation, was published in 2013. The review found the strategy had a positive impact, with smoking rates among adults now at 20% compared to 31% in 2003. The proportion of children exposed to second-hand smoke at home fell from 11% to 6% between 2014 and 2015. Smoking rates in the most deprived areas were found to be at 35%, compared to 10% in the most affluent areas. Dr Garth Reid, principal public health adviser at NHS Health Scotland said: “The evidence shows the positive impact of tobacco policy, ranging from the display ban which put tobacco out of sight in small shops and supermarkets to the introduction on smoke free NHS grounds. “Yet, levels of smoking are still highest in Scotland’s most deprived areas, with 35% of people living in the most deprived areas smoking compared to ten percent in the most affluent areas. Dr John McAteer, senior research fellow at Edinburgh University, said: “One of the aims of the 2013 tobacco control strategy was to reduce second hand smoke exposure among children by 2020. “The most recent Scottish Health Survey shows that second hand smoke exposure fell from 11% to 6% between 2014 and 2015. “This equates to 50,000 children having been protected from the harms of daily second-hand smoke exposure at home. The Scottish government’s efforts to reduce smoking in Scotland are working, according to a new report. The review, conducted by the University of Edinburgh and NHS Health Scotland, said the tobacco control strategy had shown a “positive impact” over the past five years. However, the report’s authors cautioned that smoking continued to be a bigger problem in more deprived areas. The aim is to have a “smoke-free generation” in Scotland by 2034. The report concluded progress had been made across all three areas of tobacco policy: prevention, protecting people from second-hand smoke and helping people stop smoking. The review also said there had been a reduction in cigarette brand awareness in young people, which was attributed to products being moved from view. Dr Garth Reid, principal public health adviser at NHS Health Scotland, said: “The evidence shows the positive impact of tobacco policy, ranging from the display ban which put tobacco out of sight in small shops and supermarkets to the introduction on smoke free NHS grounds. “Yet, levels of smoking are still highest in Scotland’s most deprived areas, with 35% of people living in the most deprived areas smoking compared to 10% in the most affluent areas. When the strategy was published in 2013, the number of adults smoking in Scotland was already falling, but NHS Health Scotland said it was still the single most preventable cause of ill health and premature death in the country. There are more than 13,000 deaths – a quarter of all deaths – and 56,000 hospital admissions related to smoking every year, according to the body. Dr John McAteer, senior research fellow at the University of Edinburgh said: “One of the aims of the 2013 tobacco control strategy was to reduce second-hand smoke exposure among children by 2020. “The most recent Scottish Health Survey shows that second-hand smoke exposure fell from 11% to 6% between 2014 and 2015. This equates to 50,000 children having been protected from the harms of daily second-hand smoke exposure at home. A European Commission spokesperson has told EURACTIV.com that any loss in the tobacco industry’s turnover arising from health warnings or plain packaging should be offset against the cost of treating people with smoking-related diseases. The revised EU Tobacco Products Directive came into force in May 2016 and introduced stricter measures on packaging. For example, 65% of a packet’s surface should include health warning pictures and text. Member states are also free to take additional measures, such as enforcing the use of plain packaging. France, Hungary, Ireland, Slovenia and the UK are among the countries that have already adopted this measure. For the World Health Organisation and public health NGOs, plain packaging is an ideal tool to reduce the appeal of smoking. On the other hand, the tobacco industry claims it amounts to a “brand ban”. Ben Townsend, vice-president for Europe at Japan Tobacco International (JTI), recently told EURACTIV that the ban simply doesn’t work. “In Australia, the first country to introduce plain packaging more than four years ago, government data showed that the decline in smoking has actually stalled,” he said. When the British government introduced plain packaging, the tobacco industry attempted to block it by invoking intellectual property rights. But it lost the court case. In Ireland, press reports referred to industry “threats” about the country’s economy. Dublin decided that all tobacco products manufactured for sale in Ireland from 30 September 2017 must be marketed in standardised retail packaging. Ireland’s Ministry of Health told EURACTIV in a written statement that a wash-through period would be allowed, meaning any products manufactured and placed on the market before the September cutoff date will be permitted to stay on the market for a 12-month period (i.e. until 30th September 2018). According to the ministry, the aim of standardised packaging is to make all tobacco packets look “less attractive to consumers, to make health warnings more prominent and to prevent packaging from misleading consumers about the harmful effects of tobacco”. But the Irish Independent reported earlier this month that the three tobacco giants (British American Tobacco, Imperial Tobacco Group and JT International) had threatened to undermine the Irish and EU economy in response to the measure. The three companies sent a letter to former European Commissioner for Economic and Monetary Affairs and the Euro Olli Rehn warning him about the catastrophic implications of plain packaging. In the letter, according to the Irish newspaper, the tobacco firms indicated they would seek compensation for damages which could “undermine savings […] and negatively impact the Irish economy”. Contacted by EURACTIV, the European Commission confirmed that the directive allows states to introduce further measures relating to plain packaging where they are justified on public health grounds, are proportionate and do not lead to hidden barriers to trade between member states. But the executive does not support the argument that plain packaging comes at a financial “cost” to the European economy. “Any loss in the industry’s revenues or a country’s tax revenues from tobacco products arising from e.g. health warnings or plain packaging should be counterbalanced against the cost to the economy of treating people with smoking-related diseases,” a Commission spokesperson said. The EU official pointed out that healthcare to treat people with smoking-related diseases costs €25.3 billion every year in the EU and an additional €8.3bn is lost to absenteeism/premature retirement. “This is a total cost of €33.6bn a year,” the spokesperson emphasised, adding that a 2% reduction in smoking alone would translate into annual healthcare savings of approximately €506 million for the EU.